In an effort to raise the positive profile around vocational education and career opportunities, Big Picture Learning (BPL) and FableVision—both long-time champions of progressive, creative approaches to education—are collaborating to produce a series of short, animated films to help students, educators, and caregivers understand and appreciate successful career paths that extend beyond the four-year college experience. Navigating Our Way is the first film project in BPL’s initiatives (including the Harbor Freight Fellows Initiative), aimed at providing new forms of apprenticeship and mentoring for youths exploring career pathways in trades and crafts. Navigating Our Way follows the story of best friends Seymour and Sylvie, who grow up near the busy shipyards of New Orleans and share a similar set of lofty dreams which include building, ships, and the harbor itself. Following their high school graduation, Seymour parts ways with Sylvie to go to college. Sylvie surprises Seymour by rejecting her many college acceptance invitations in favor of apprenticing and learning from her family’s shipyard workshop. Eventually, fate brings the two back together with an opportunity that requires both of their unique and important skills, and one that affirms that their different choices and journeys were equally valid. Navigating Our Way, produced by FableVision Studios, is narrated by award-winning film and television actor and New Orleans native Wendell Pierce. The film was written by Elliot Washor (Big Picture Learning) and Paul Reynolds (FableVision), with character design by New York Times best-selling picture book author Peter H. Reynolds. The film’s original music score was composed by New Orleans native and BPL student, Brian Richburg Jr., in collaboration with composer Tony Lechner. 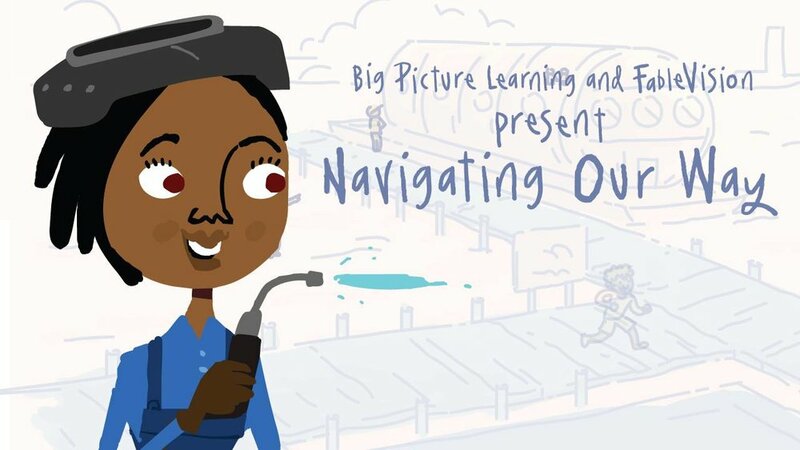 Along with tackling the stigma around the trades, Big Picture Learning co-founder Elliot Washor hopes this film will work to evolve society’s understanding of learning as a solely cognitive activity. “We are forgetting how to work with our hands, and how to create things.” says Washor. “You can’t talk about human intelligence without also talking about hands. Our nation’s CTE (Career Technical Education) programs need a creative rethink to offer a blend of head-heart-hands learning.” Of course, shifting social-cultural perceptions around the trades is an enormous challenge. That’s why the BPL and FableVision teams are leveraging the power of narrative storytelling to foster attitudinal change. Don't Miss Big Picture Learning at SXSW EDU! Big Picture Learning is heading to Austin, Texas to take the annual SXSW EDU conference by storm. Click on the images for more information about their upcoming sessions and be sure to add them to your schedule!